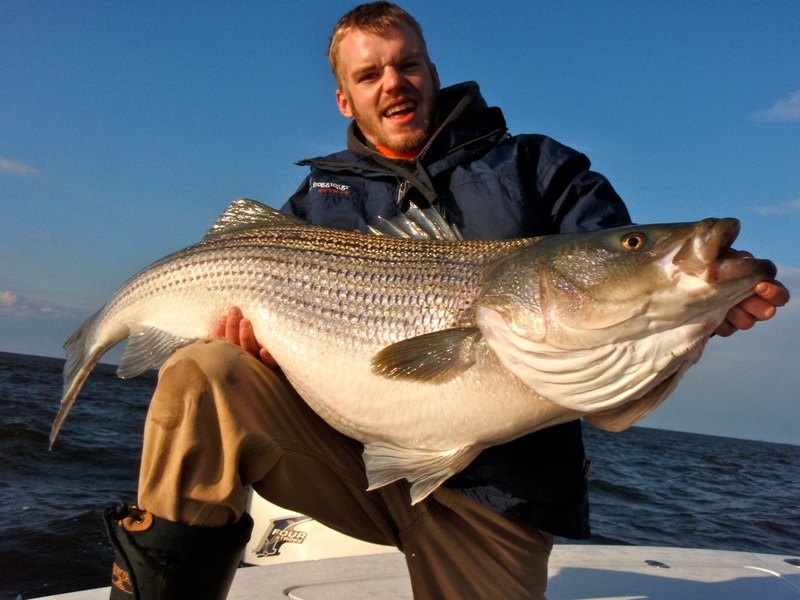 No, it’s not the opening weekend of striped bass catch-and-kill season in Maryland’s Chesapeake Bay. That doesn’t happen until April, 16th. The opening I’m speaking of is the first day of baseball season. The Baltimore Orioles played their home opener today. Since they’re undefeated so far this season, there’s been plenty of celebrating. 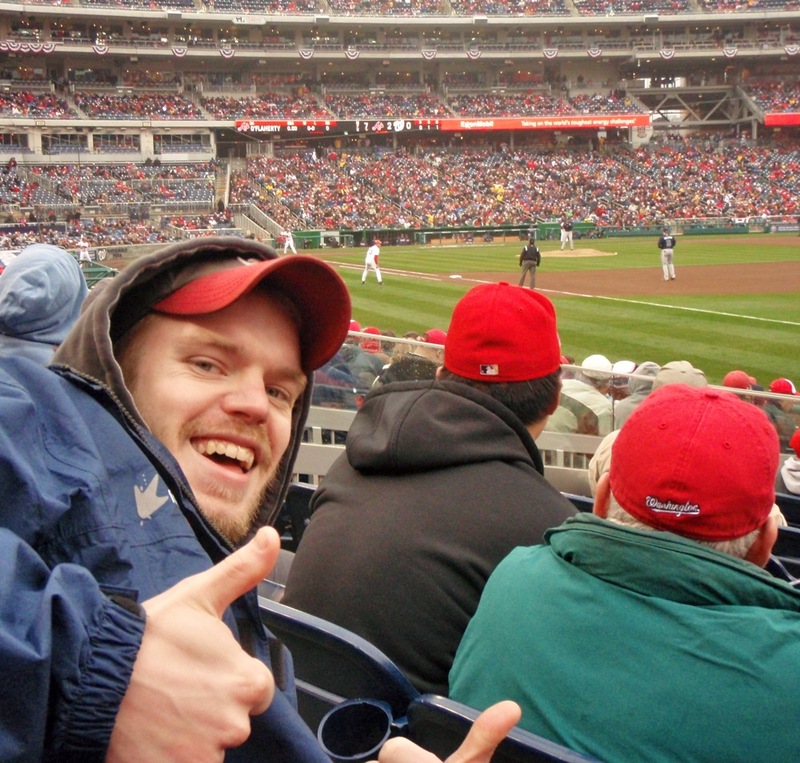 The Washington Nationals started their season last Thursday. They opened against the Atlanta Braves this year. I’m originally from the southeast so I’ve always followed the Braves. 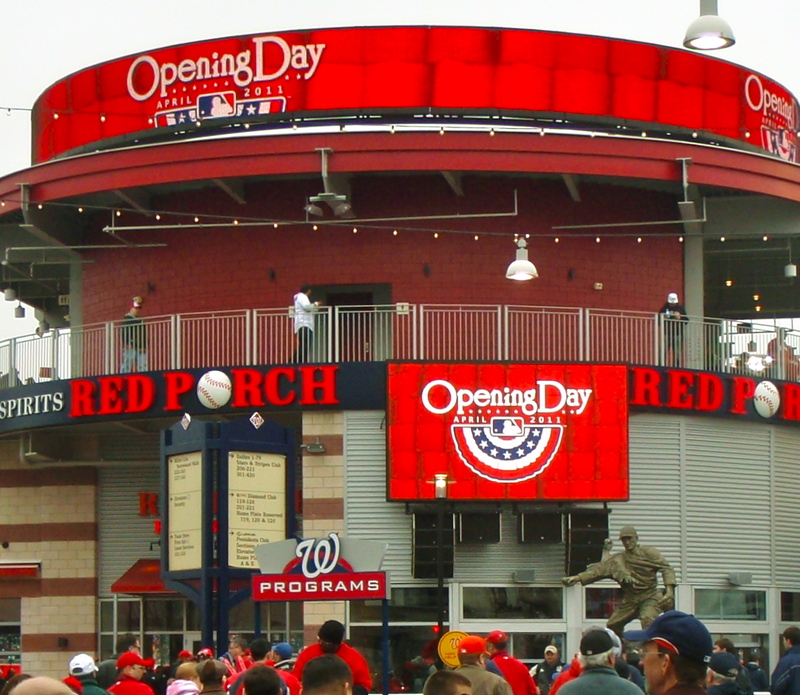 I’ve recently become a fan of their division rivals the Nationals because they have such a beautiful stadium so close to home. I looked forward to watching these two teams play this year. My son Cory is a rabid Braves fan so he took some time off to travel up from Tennessee to root against me. 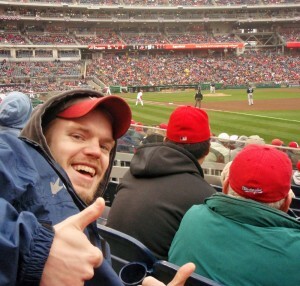 His long weekend got off to a good start when the Braves dropped the Nats 2-0. It got even better on Friday when he caught the biggest rockfish of his life, then broke his record twice on his next two casts! Cory is a good fishermen. You might remember my “Land of Giants” report from last spring when he hit a home run with a 65-pound black drum on a 6-inch BKD using ten-pound-test line. Fishing has been good this spring, so I expected him to catch a few on this trip – I just didn’t expect him to do it in with such drama! We left Kent Island late Friday afternoon and set off toward the south looking for feeding fish under diving gannets. The fish weren’t where we thought they would be, so we settled for warm-water discharge fishing. It was windy and cold, so our fishing spot wasn’t crowded. The fish were biting. I connected on my first cast using a white 10-inch BKD hotrodded with purple garlic dye. As I was releasing my fish beside the boat, I looked over my shoulder to see Cory’s rod dipping violently. 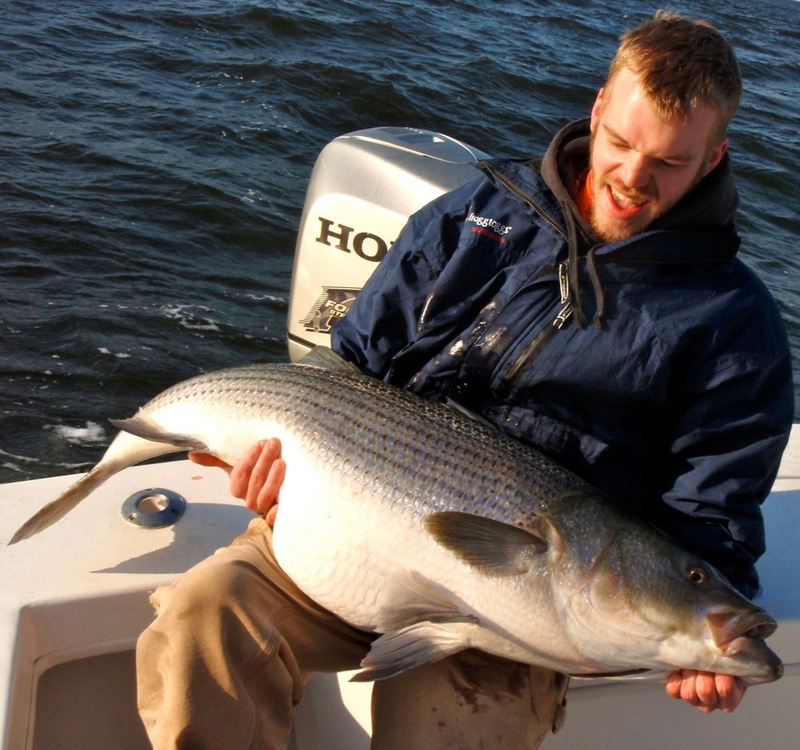 He quickly landed a 39-inch striper. I grabbed his leader and turned his barbless hook upside down, setting the fish free without ever tak ing it out of the water. When he told me that was his personal best striper, I felt bad. I apologized for not getting a photo but suggested he might get a bigger one since conditions were perfect. Sure enough, he stayed true to his game by connecting on another big fish his next time up. Personal best number two checked in at 45-inches. A striper that size put Cory in the league with the best light tackle fishermen I know, but apparently, he wasn’t satisfied. I reset our drift as Cory stepped up to the plate in the bow of the boat and made another 30-yard pitch into the wind. He kept the spool free in order to get the lure down deep, then followed it with his rod-tip as the current swept it downstream. That’s the perfect technique for catching big fish in high current situations. You can occasionally catch nice fish by jigging beneath the boat, but if you want consistent trophies, you have to get the lure in the strike zone from a distance. The two-ounce kandy korn jig head touched down and Cory snapped it back up. Just before it should have hit the bottom again – Wham! Cory set the hook solidly. His rod dipped once, twice, three times before the fish turned around and lit away across the 19-foot-deep flat. He lowered his rod tip and let the Revo low-profile baitcaster do its job. His fifteen-pound-test braid was screaming off against his drag, so I started the engine and backed the boat toward the fish to keep him from getting spooled. Finally the big fish turned and he started gaining grou nd. In less than 10 minutes he had one of the biggest stripers I’ve ever seen beside the boat. It took all I had to pull the fish over the rail. We measured it at forty-eight and three-quarter inches. It might have gone another inch or so if I had pinched the tail a little. That’s a world-class striper. I’ve become pretty good at estimating the weight of fish over the years, and there’s no doubt this one went over fifty pounds. You can identify a truly heavy fish in photos just by looking at how the angler holds it. I know a lot of strong guys, but unless you’re Coach Rich Jenkins, I don’t know many who can hold a 50-pound fish out toward the camera. Cory couldn’t get this big fish above his belt, so he ended up supporting it against his knee for the picture. I gave him a hard time about that, but anyone who has ever caught a big fish knows that’s just keeping it real. This one was a legitimate grand slam. Like that drumfish he caught last spring, another fish of a lifetime. My brother Creig is visiting this week so I’ve taken a few days off to fish. 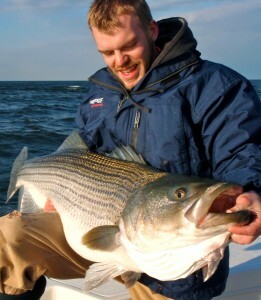 I’m looking forward to the chance for more big stripers, this time (hopefully) a lot closer to Kent Island. Who knows, we might even get in another baseball game this weekend. Water temperatures are holding in the mid-40s, but should start rising fast. This is traditionally the best time of the year to catch-and-release trophy stripers. I’ll keep you posted! Great read Shawn..a 49″ (50lber) is quite an accomplishment on medium bass tackle!….congrats to Cory..world class fishing..See ya on the water soon..
A Braves win and big feeshes makes for a very good weekend. Congratulations to Cory. What a day and what a dad! Nice job Shawn. Sounds like you 2 had a blast! Bet you there was some high 5’s after that release. Great story, and congratulations to Cory! That fish is worthy of getting a replica made for the wall. I’ve seen a lot of 42 inch called 50s this year. You’re right, you can’t hold a fish that size out front of you. Thank you for keeping it real. That’s one beautiful rockfish. as always a great read, Shawn. congrats to Cory on his personal best….times 3! Way to go! Congratulations Cory. Nice day. Shawn, excellent report as always and congratulations Cory! Do you think jigging the bay bridge this weekend will produce any fish? Thanks for the comments and thanks from Cory as well. No, I doubt jigging at the bridge will be productive until the spring turnover. Right now the fish still want to stay deep unless they’re rounding up bait pods. If you jig the bridge your best bet would be the deeper pilings or the rock piles. It’s a long shot either way right now.